The ROTA-LIFT® manual matchplate machines are ideally suited for the production of castings from larger matchplate patterns. 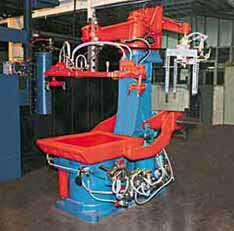 Our unique Matchplate Molding Machines have an anvil type pre-jolt and Ram-Jolt® for use during the squeeze operation. One of our most significant developments is the development of Whisperam® noise-controlled jolt. Thorough testing has delivered molds of the highest quality and density, while maintaining a low noise level’ important for today’s foundry’s. We furnish the Whisperam® as standard equipment with all our ROTA-LIFT® units. There are two machine sizes that accommodate most every mold size. The 3161 or the 3191 machines can be equipped with a matchplate handling device which is designed to assist the operator in drawing matchplates normally too large for one man to conveniently handle.